This site is a collection of some broadband and ISP related resources I have built up over the years. I don't go in for having hundreds of links, or dozens of pages of data. Just some helpful bits and pieces, which can help me and others from time to time. I joined the thinkbroadband (or ADSLguide as it was known) forums in 2002. Over those years, it became apparent that it's always easier to fix a broadband problem if you have good data at your disposal. If you want to get in touch you can get me via my Twitter Page, or e-mail me at hotmail.com (you can guess the username, I hope!). Failing that, you can PM me via the thinkbroadband forums, but you'll have to register first, and please appreciate that this is not the preferred messaging route. I should also thank all the staff (and many of the members) of the thinkbroadband forums. The various tools and links on this site can help me diagnose (or reduce the misdiagnosis of) broadband related problems. If you ever get a broadband problem, many of the tools used here can give others the vital information they need, so as not to ask 20 questions. I recommend that anyone builds up a similar set of resources for their broadband connection. I will probably add and remove, or chop and change what's what as time goes by. I'm always on the lookout for various handy tools and programs for such things. If you need specific advice or info on any tools here, visit the sites linked. I don't give advice on line tweaking. Such things are generally on a line by line basis, and there are several factors to consider, so most connections, while hardly unique, cannot be readily categorised for collective tweaking advice. For what it's worth, my experience of line tweaking is hit and miss, and gains are minimal. Distance from the exchange is everything, and having good broadband kit, properly installed is crucial. Get those two factors right, and the rest will be fractions (and not worth the bother in my humble opinion). Having said all that, it doesn't hurt to ask others, so the advice is to ask others and get an idea of what's possible. All lines are different, and some will require fiddling. Just a collection of links that I have found to be helpful over the years. The more commonly requested ones, if you like. Some may require registration (e.g. ThinkBroadband Ping Monitor). I take no responsibility for any software or your use (or misuse) of it. I love to minimise and clean up web code. All too much of the web is awash with bloatware and badly formed code, when it doesn't have to be the case. I completely accept that some of the best looking web code can be more difficult to minimise and clean up, but again that's not always the case, and this is becoming more obvious as browsers turn to HTML5. This site should validate in HTML5 and CSS3 (if you pop a doctype in your web code, you should be looking to adhere to the doctype's requirements). In addition, you should find that the site's footprint is tiny, while being perfectly acceptable as a website. All five pages of this site took about three days to throw together, from first idea to final release. 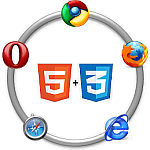 This site has been tested in Firefox 17, Chrome 27, Opera 12, Safari 5 and Internet Explorer 9. Did you know that just 7% of the top 100 websites validate? Thanks very much for visiting, and I hope you got something useful from the site. Original Forever template by Automattic.